2019 Chevrolet Cruze vs. 2019 Chevrolet Malibu: Compare reviews, safety ratings, fuel economy, etc. Passengers in the back seat will be able to stretch out a lot more in the Chevrolet Malibu than the Chevrolet Cruze, due to its greater head- and legroom. As far as headroom and legroom go, there's not much difference between the Chevrolet Cruze and the Chevrolet Malibu in the front seats. 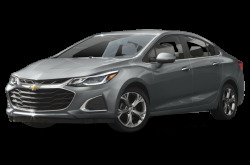 You'll be making about the same number of stops at the gas station with the Chevrolet Cruze as you will with the Chevrolet Malibu, as they get the same number of miles per tank of gas. There are a lot of factors to consider when calculating the overall cost of a vehicle. The main consideration is Manufacturer's Suggested Retail Price (MSRP). Based on MSRP, the Chevrolet Cruze is clearly a better financial choice over the Chevrolet Malibu. Another consideration is the Destination Charge, which is a standard charge for transporting the vehicle to the dealer from where it's built. The Chevrolet Cruze and the Chevrolet Malibu have similar Destination Charges. Since the Chevrolet Cruze is much slimmer than the Chevrolet Malibu, it'll be much easier to find a wide enough space in a crowded parking lot. If you go with the Chevrolet Cruze, you'll have a much easier time finding a large enough space to park than you will with the Chevrolet Malibu. With its lower torque, the Chevrolet Cruze doesn't do as good a job transmitting power to its wheels as the Chevrolet Malibu. The Chevrolet Cruze has less horsepower than the Chevrolet Malibu, so it will probably be somewhat slower. In terms of seating you'll be able to fit the same number of people in both the Chevrolet Cruze and the Chevrolet Malibu. The Chevrolet Cruze comes with essentially the same basic warranty as the Chevrolet Malibu. 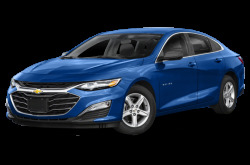 Compare the 2019 Chevrolet Cruze and the 2019 Chevrolet Malibu.